Zoe is forced to duel Tamara; Daniel forces a vote at Graystone Industries; Lacy is held captive at the Willow house. 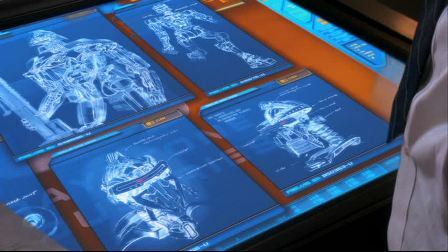 The gladiator arena in New Cap City seen at the beginning of the episode is a dark version of Atlas Arena, the home stadium of the Caprica Buccaneers pyramid team. In the dream sequence of child-Zoe drawing a picture of the house fire she was caught in, notice that the girl uses square-cut crayons, not round. Is this the normal shape of crayons on Caprica? There are several brands of square crayons in our own world, cut that way so they can be stacked, won't roll off the table, or just for uniqueness. This episode introduces Messenger Zoe. The Messengers seem to be somewhat analogous to the Beings of Light of BSG70, but these "angels" are cast in the image of someone familiar to the experiencer, as seen in BSG2000. In this case, Zoe's teenage self is the image seen by young Zoe and who apparently rescued her from the house fire many years ago. In the now, the avatar of the teenage Zoe sees the Messenger as well, guiding her to use her strength to rise against her tormentors in the gladiator arena. When Amanda opens the cabin's kitchen cupboard at 12:10 on the DVD, one of the mostly-obscured boxes on the shelf looks to be a box of Post Shredded Wheat from the package's design. 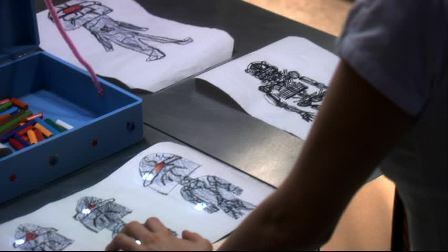 The flashback scene at 21:19 shows Daniel's early designs for the Cylon prototype, inspired by drawings done by young Zoe as a child. As the Zoe avatar runs her hands along Daniel's bookshelf at 23:39 on the DVD, the books NCLEX-RN and Internet Piracy Exposed are seen. These are actual books in our real world. NCLEX-RN is a reference to National Council Licensure Examination, an exam for the licensing of registered nurses in the U.S.
At 25:38 on the DVD, notice that the mug Lacy is using has a picture of a cat on it. As far as I know, this is the only appearance of a domestic cat to have appeared in the BSG universe. When Clarice tells Lacy she's going to send her to Gemenon to join a special program there, Lacy asks about her mother. Lacy's mother is not mentioned again after this episode, Clarice only saying that they'll take care of her. Exactly how is it that Messenger Zoe saved young Zoe from the fire? The Messengers do not traditionally have a physical effect on the environment, either by choice or inability. So it seems unlikely the Messenger carries Zoe out. Did she simply point out an escape route and encourage the child she could make it out of the house? Were young Zoe's visions of the Messenger Zoe her inspiration for wanting to create a perfect copy of herself as an avatar? It seems possible, as in one flashback here, we see the Messenger encouraging Zoe in the creation of artificial sentience. Why is the Messenger interested in the creation of artificial sentience? Since we know from BSG2000 that the Sacred Scrolls which form the basis of much of Colonial religion state "All this has happened before, and all of it will happen again," does that mean the Messengers have been instrumental in human creation of artificial sentience previously as well? It's possible that Clarice has some knowledge of the Messengers. She seems to believe that Amanda's visions of Darius may be divine intervention. It's also possible that Zoe told her of Messenger Zoe, though this is speculation.